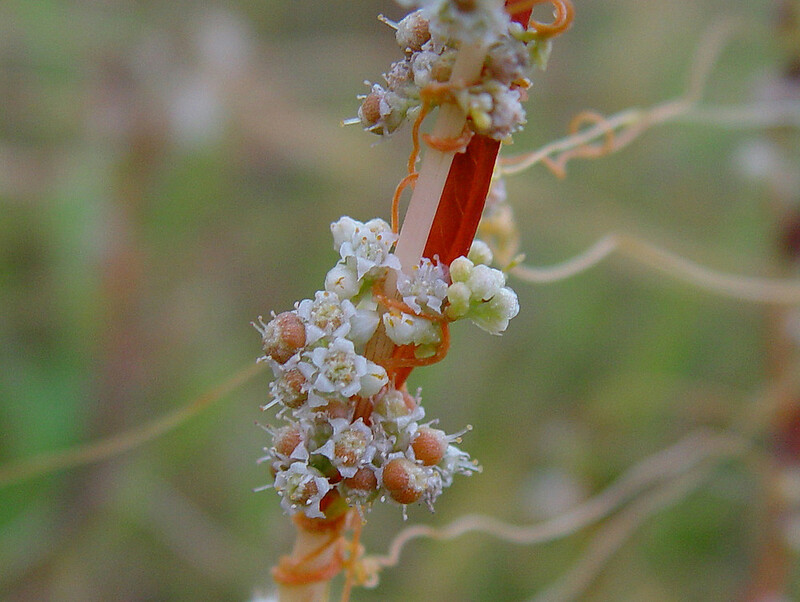 Cuscuta gronovii. vine, flowers, leaves wart-like protuberances on vines, developing fruit. David G. Smith.www.discoverlife.org (Accessed 7/2014). Cuscuta gronovii is a parasitic annual, orange-stemmed vine, plants lack chlorophyll, closely entwining host plant stems and entering host by numerous sucker-like haustoria, seedling root system degenerates when haustorial connection to host formed; vines are not photosynthetic but are strongly phototrophic and climb only upward and counterclockwise, forming tangled masses at top of host stem. 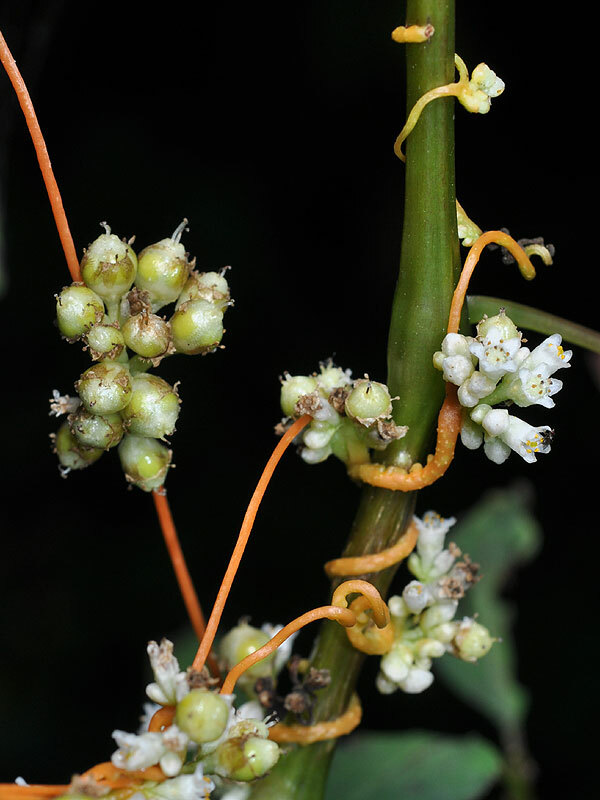 Cuscuta gronovii stems, flowers and new fruit. By Glen Mittelhauser. Copyright © 2018 Glen Mittelhauser. New England Wild Flower Society. gobotany.newenglandwild.org (Accessed 2/2018). Flowers white, 5-parted, about 0.3 cm wide, in dense clusters, petal lobes as long as tube, calyx lobes, much shorter than petal tube. Fruit whitish rounded, cupped by withered flower, about 0.3 cm wide becoming dry, persistent into winter, massed at tops of host stems; seeds 2-4 ca 0.1 cm (Uva et al. 1997); blooming and fruiting July-Oct.
Habitat: A favored host is Impatiens capensis. In open areas on other herbs, especially legumes, occasionally on shrubs, may kill host. Notes: Listed as a “Noxious weed” by the USDA and by 43 states (USDA 2004).